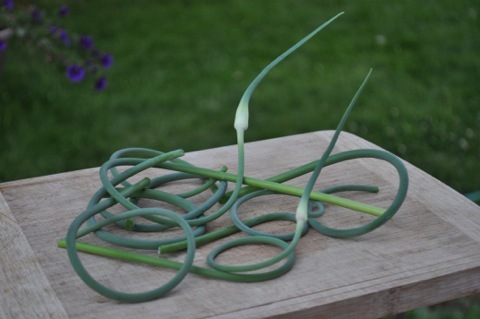 If left to grow, the scapes develop into flowers, depleting energy from the garlic bulb in the ground. Not exactly knowing where to cut the scapes, I watched a you-tube video with O. Then he helped me cut the stalks at the point where the first leaves were growing. As he helped me chop the scapes, he took a taste, but decided he preferred fresh cut chives over scapes. His mind quickly changed with a few additional ingredients, a quick whir in the food processor, and added to Quinoa Veggie Curl Pasta. It had a great lemony and light garlic taste. We couldn’t stop eating it!!! I think I even like it better than basil pesto! Since Skoogie can’t eat pine nuts, I used sunflower seeds in the pesto and it was devine! Combine the scapes, sunflower seeds, lemon zest and juice along with salt and pepper in a food processor. Pulse until well combined and then pour the olive oil slowly through the feed tube while the motor is running. Transfer the pesto to a bowl and stir in the grated cheese. If you plan to freeze the pesto, add the cheese until after you've defrosted it. Double and quadruple the recipe as needed. A friend shared a link that was included with her CSA scapes with ideas beyond pesto from stir-frys to hummus. Go and get yourself some garlic scapes at your farmer’s market or your garden now!